– Shredded AF – Click Here for info. – Focused AF – Click Here for info. The premiere all-in-one fat burner on the market for men and women, comprised of the purest and most potent ingredients backed by science. 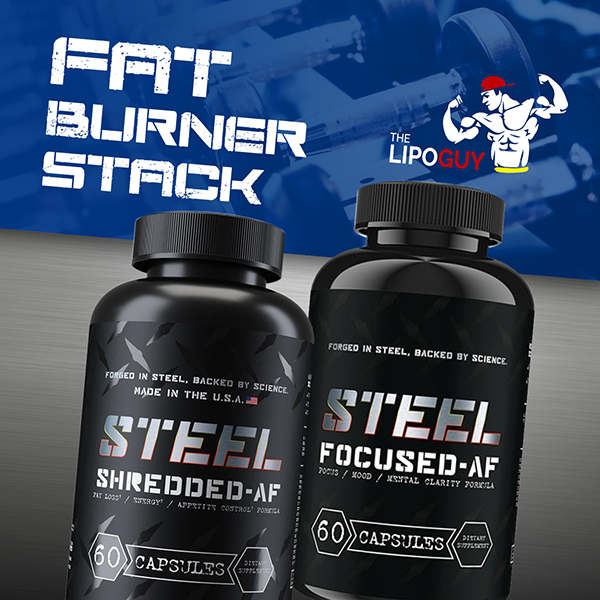 STEEL Supplements SHREDDED-AF is an advanced multistage thermogenic that focuses on boosting metabolism, suppressing cravings and providing all day energy and mental clarity without a crash. STEEL Supplements Shredded-AF can absolutely be used pre-workout, in fact this is quite common and very effective. …Then you’ve got STEEL Focused AF to give you that focus and mental clarity for day-to-day activities. Not only will focused AF help you with energy and elevate your mood, it can also help curb and control cravings as well as slightly increase your metabolic rate for additional weight loss throughout the day. PLEASE NOTE: These two products should not be mixed together. I.e. Do not take Shredded AF & Focused AF capsule together. These should be taken separately and at minimum 3-4 hours apart. Before Training: 1-2 x Shredded AF 15-20 minutes before exercise. Do not mix with any preworkout or other stimulant product such as focused AF.